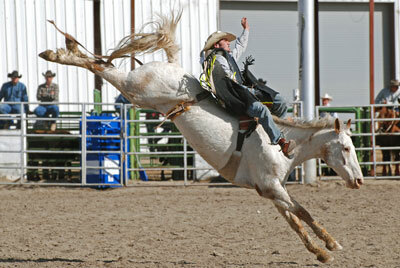 An evening of rodeo is a wonderful complement to your dude ranch stay. Laramie Jubilee Days Rodeo is lots of fun for the whole family. Have you seen team roping like the kind pictured here? How about bulldogging, saddle bronc, and bull riding? 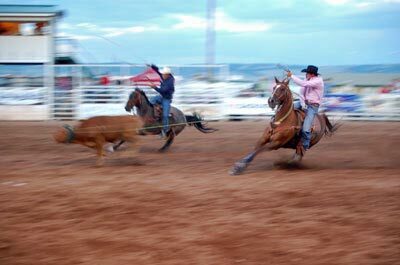 Visitors and locals alike enjoy professional steer roping and bull riding. There are mountain man rendezvous events, cowboy poetry readings, art shows, parades, fireworks, and lots of great food. At night, Laramie hosts other events including a popular street dance in the historic downtown. You might even get a chance to pose for a picture with one of our Rodeo Queens! During rodeo weeks we're still riding, fishing, and exploring the outdoors back at the ranch. Our program of activities continues as usual. The Laramie Jubilee Days web site has lots more information. Generally, for this home town rodeo tickets will be available at the gate. 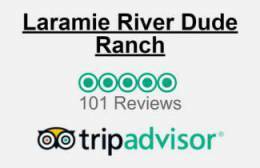 The ranch does not provide transportation to and from Laramie which is about 45 minutes from the ranch. As you decide how to travel to LRR, you might consider the rental car option in order to have the flexability to make the trip during your stay.